This image has received a lot of press in recent weeks. It comes from this study. What are your thoughts on this? I have found in my work that many people are not aware that there is a complex physiology to emotion that it is intertwined inextricably with the body. This separation is rooted in the historical splitting of “mind” from “body”. Emotional physiology is increasingly being studied in relationship to bodily processes including pain. It is not possible for the experience of pain to not have an emotional component due to the wiring and chemistry of the brain, nervous system and body. All bodily sensation and both internally generated and external (incoming) information passes through emotional interpretive and threat detection “centers” (regions/pathways in the central nervous system). In addition, it is well known that many areas of our body hold emotional tension and when that emotional component is addressed alongside the physical experience of it, the potential for improvement in the experience of pain increases. Joseph LeDoux, a neuroscientist, has studied and written extensively on the biological underpinnings of emotion and has made many good contributions to the topic. However, the title of his primary work, The Emotional Brain, makes a common error which I call “brain-centrism”. The current accessibility of research methods that look at activation patterns in the brain, while necessary, important and of great interest, also has led people to focus excessively on the brain and miss what’s happening in the body. There is a two-way communication going on at all times. This free public access article from NIH provides some framework for understanding bidirectional processes, “top-down” and “bottom-up”. In a practical example, if I am very stressed and emotional, it can not only lower pain threshholds when presented with a physical stimulus, but can contribute directly to feeling physical pain and tension in the body (top-down) independent of a tissue stimulus or injury. Similarly, if I have a direct injury to the tissues of the body, emotion is produced as a natural part of that experience (bottom-up). If you’re suffering with chronic pain, you are probably already aware of the connection between mental and emotional stress and physical tension and pain. I have worked with persons experiencing chronic headaches for many years, and experience migraines myself from time to time, and stress/emotion is a definite part of the pattern. Most of us experience this in one way or another at different times in our lives. Often this is through muscular tension, but it can also show up in upset stomach, anxiety, widespread fatigue, or other stress related symptoms. It is important to remember that stress involves a complex physiology that involves the entire body. It is important to remember that this connection is not “out there” or abstract. The involvement of stress and emotion in the development of pain is not a weakness and a person is assuredly not to blame. Yes, the brain is intimately involved in the experience of pain, but it is not “all in the head” meaning that it is not real or somehow the experience of it is “made up” or purely a psychological phenomena. To summarize, there is a very real physiological connection between emotion and the muscles, nerves and other tissues and functions of the body. Historically we have tended to think of the mind, body, and emotions as separate things, but they are not actually separate. They are all part of a whole, the “living system” that we each are. Mind, body and emotions have shared physiology – electrical, cellular, chemical… For an overview of this, the classic book by Candace Pert, Molecules of Emotion, is a great starting point if you would like more information. 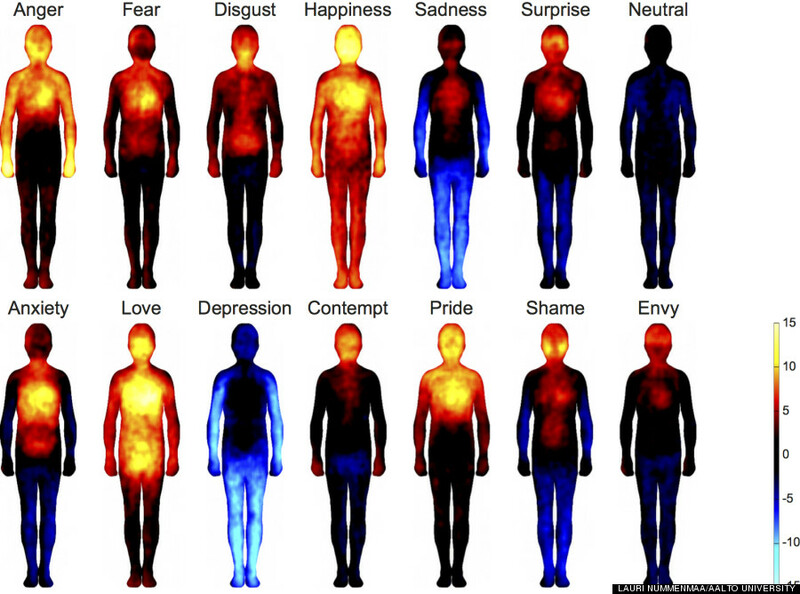 Let’s talk a bit more about emotion. I like to think of emotion in the abstract and energetic context, even though we can easily look at it from the physiological. 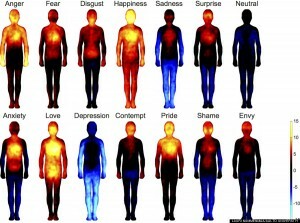 Emotion is e-motion – energy in motion. As we experience life, emotions arise out of a complex set of energies that include but are not limited to environmental stimuli, physical patterns, chemical and nutritional factors, cognitive/mental, and so on. Emotions can be seen as energy patterns moving through the body in response to continually changing experiences, events and stimuli. When emotions are moving freely they help us to process, learn from and integrate our experiences in life. When emotion is allowed to move up and through the body/mind, they do not contribute to lasting physical tension or chronic pain. Problems arise when our emotions are not recognized, purposefully or unconsciously ignored, or sustained (“stuck on”). I believe it was William Blake who said something similar to “All emotions are innocent”. We can eventually learn to embody this teaching, but most of us start out finding that we have fixed patterns of emotion and/or that we tend to avoid certain emotions. This can happen when the brain learns that certain emotions are a threat to our wellbeing. This can happen either through negative early life experiences (read about the “ACE” studies for more information about the impact of early life stress on health later in life and the connection to the emotional and stress responses in the brain and body) or simply via longer term/sustained activation of the body’s stress response system. When that happens, our mind and body learns to protect us from uncomfortable emotions by unconsciously suppressing them and blocking the natural expression of emotion. The questions I pose to the people I work with is: “How does emotion show up in your body?” “Where does the flow of energy and emotion get stuck in your body?” “Is it in tight/tense muscles?” “Is it through poor breathing patterns?” “Is it in an upset stomach?” Exploring this and working simultaneously with the physical tissues of the body alongside emotional awareness and self-expression is a necessary combination and skill for each of us to learn. A goal in mind-body skills training is to learn how to become aware of your emotions and then to be able to express them. An important substrate to this process is to assist the unconscious brain in learning that that is actually a safe thing to do. Chronic tension patterns in the head, jaw, neck, back and virtually anywhere in the body can be part of a long-term habitual and unconscious pattern of blocking the flow of emotion. As a mind-body integrated therapist, my goal is to help patients become aware of their unconscious patterns (mental and physical) so that they can learn how to consciously and safely feel their emotions and bodily sensations and allow them to express freely. When the brain no longer perceives emotions as a threat, the body can begin to learn to relax. Likewise, learning to relax the body can assist the mind in relearning states of safety and nurturance. Remember that all emotion is intrinsically innocent. When allowed to flow, express and release, emotion does not “cause” pain. However, chronically stuck emotions can contribute to a sensitization process in the nerves, muscles and tissues of the body and contribute to the experience of pain. Depending on the level of negative early life experiences, trauma, or chronic stress that a person has been through, different amounts of time and support are needed to learn to work with this mind-body process. Doing so through the lens of mindfulness – curiosity, compassion, acceptance, patience and loving-kindness is critical. It begins with awareness, working with the sensations of the body, and a supportive environment. We can all learn to do this. There are a growing number of mind-body integrated professionals out there. They come in different forms and settings – from PT’s and OT’s, to physicians, to yoga therapists – feel free to contact me if you are unsure how to look for one in your area.